IPS (In-Plane Switching) simply refers to how these types of panels are produced and what distinguishes them from other panels. In Plane Switching is nothing new; in fact, some of the higher end models have been using it for several years, like Lenovo and most notably, Apple. Despite their preference amongst the more prestigious manufacturers, some more affordable options can be found too if you look hard enough. Is IPS monitor good for gaming? Most gamers and design creatives prefer IPS monitors because of the vivid colors and their 8-bit interfaces versus the 6-bit versions on other monitors. This detail is often overlooked until you consider how well these monitors handle the gamuts like sRGB and Adobe RGB. If you’ve ever looked at an IPS monitor compared to others, you’ll notice that the viewing angles make it possible for the screen to be comfortable to look at. The appearance of this monitor can best be described as beautiful to look at but may be too much for some people. The looks pull you in, but it doesn’t stop there. Even at different angles and rotations. This doesn’t seem like such a big deal since most people who intend to use the monitor will sit directly in front of it compared to viewing it from the top or some weird side angle. Unfortunately, there are shortcomings to having an IPS monitor. Like performance issues such as response times and pixel issues. These types of monitors are notorious for slower response times, and the pixels can cause a blurring type effect on the more intense games. If you’re one of those people who can’t stand blurring or the obvious delay, you’ll want to be mindful of the performance of the particular monitor you’re considering. Another shortcoming to these types of monitors is the backlight bleed you get where the backlight appears in the corners of certain areas of the screen. Some don’t even notice it’s happening until the screen is black or there’s a pause in the game or movie. Unfortunately, there’s no way to predict how badly each monitor will be affected, so it’s a bit like taking a chance. We’re hoping with this review and buying guide, we can help eliminate that risk and help you in the right direction of finding the best IPS gaming monitor for you. 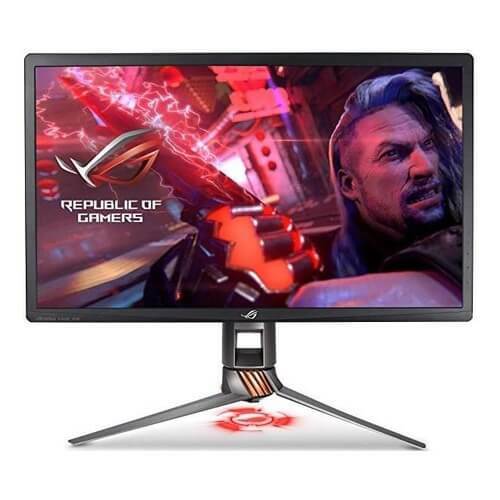 The ASUS ROG Swift PG27UQ is currently one of the most in-demand gaming monitors right now. When you take a look at what’s behind the screen is easy to see why this monitor is one of the tops in demand monitors today. When playing non-HDR games, you can get up to 4k and 144 Hz, but if you intend to play HDR games, it can be done, but expect some lower quality images and a little bit of a lag. Aside from that, this monitor is right up there with the more expensive competitors. The response time sits at around 4ms, which will effectively eliminate most blurring; but keep the HDR versus non-HDR use in mind. Backlight bleeding and IPS glow tends to be one of the drawbacks with an IPS monitor. But we don’t see an issue with either of these with the ASUS ROG Swift PG27UQ monitor. Lastly, the G-SYNC HDR keep things running smoothly with no noticeable lagging or screen tearing. With the option to toggle the light projection and LED off, you can kind of tone things down a bit, but not by much. The screen has a matte finish with seems to be immune to smudges and fingerprints while also reducing annoying glares. Resting on a stable stand, this monitor is capable of swiveling, pivoting, and tilting. You can even adjust the height if you want or mount it to the wall with the right hardware. Great response time with low input lag. The design and build feel stable and are definitely eye-catching. The refresh rate is capped at 98 hertz for HDR 10-bit. The Dell Alienware 1900R is featured packed with a 34” display, 3440 x 1440 resolution, and at 100hz- it’s hard to go wrong with this IPS panel. Deep blacks and grays can look washed out, but the motion is buttery smooth so we can’t really complain. Besides, you’ll quickly forget about that minor annoyance when you realize this monitor is capable of overclocking to a 120hz refresh rate. Combined with an NVIDIA G-Sync and various features which will improve your gaming experience, this isn’t a bad setup. The performance leaves little to be desired, and the slightly curved screen enhances the aesthetic appearance which also seems to pull the focus of your attention to the screen. It’s only then that you notice the beautiful and rich colors that almost seem to jump out at the user. The Alienware boasts a 4ms response time which eliminates any blurring or screen tearing- making it perfect for favorite fast-paced games. But it also gets a helping hand with the 100hz refresh rate. What about backlight bleeding and the infamous IPS glow? It’s barely noticeable, and it rarely happens, if ever. Without either of these, users often feel exhausted, even after playing for just a few minutes. The aspect ratio isn’t a problem either at 21:9, so you can be sure that your gaming experience will be an enjoyable one. Right away, the Alienware 1900R catches eyes with its aggressive appearances. It can pull it off because the entire panel is sturdy with a metal stand and a matte exterior that’s easy to keep clean. So you can easily set this monitor up on your desk and not have to worry about it breaking apart or falling over anytime soon. The screen is capable of tilting and swiveling, but if you hate stands, then you can mount it if you purchase the hardware separately. One other special touch is the anti-glare screen which is useful to prevent glares and reflections from bright lights, or windows that let light in. 4 3.0 USB ports, with one of those having Quick Charge capabilities. May need to be calibrated, and the settings played with to find the best settings that work for you. Connectivity options seem kind of limited. Tight pockets create desperate situations, but if you need a new display but can’t afford an expensive upgrade, then the LG 27UK650-W might be just what you need. Right away you’ll notice the beautiful screen, but beauty isn’t the only thing this monitor has going for it. Yeah, the performance behind this monitor is right up there with the upper-end 4k monitors, so naturally, we were impressed when we realized this monitor was a multitasker capable of handling gaming and multimedia. This 27-inch monitor packs a punch with a 3840×2160 resolution, a 60hz refresh rate, and an anti-glare screen. But then the 5ms response time rounds everything off nicely. The 99% s RGB means you’ll get incredibly vivid colors and contrasts, and with an HDR mode that automatically activates with compatible content, your gaming experience will never be the same. The incredibly lifelike images and graphics just pull you right in. The 9.2 milliseconds means there’s no lagging are blurring at all, which can cut into the enjoyment of your gaming experience. For those wondering about the FreeSync, Yes this monitor is FreeSync compatible. It couldn’t get any better, right? LG gives you a luxurious feel with its matte finish and sleek lines. Facing forward, the exterior is matte black while the back of this monitor is matte white. The only thing that puts us off of the appearances of this monitor is it looks almost too fragile to hold up for very long. It’s not until it’s put together that we realize it’s actually quite sturdy. The stand this monitor rests on will allow you to tilt, swivel, or pivot the monitor with ease. But if you’re not one for stands, then you can easily mount it; but you’ll need to purchase the equipment separately. A good middle of the road multitasker with beautiful appearances. High-quality graphics with no blurring or screen tearing. If you’re limited by your pockets, but you need a monitor that can keep up with your games and photo/video editing needs, then the LG 25UM58-P just might be for you. Once of the things that keep drawing gamers to this particular monitor is the 2560 x 1080 resolution and the ability to hit 60hz with a 5m refresh rate. Not bad at all, considering the affordability of this monitor. But if you need more Hz and the FreeSync functionality, then you’re going to need to dig into your pockets a little deeper. The LG 25UM58-P has a 99% sRGB color coverage, so right away it’s head and shoulders above most budget IPS monitors. One thing we did notice that there may be some slight discoloration as you move outward from the center of the screen. But surprisingly, there’s no backlight bleeding or any of the usual defects that seem to affect most IPS monitors. Overlooking that slight flaw, we still think this is an excellent monitor to consider if you’re on a strict budget. When it comes to gaming, the monitor can keep up without any lagging or ghosting. This monitor adjusts seamlessly to rapidly changing environments, so there’s nothing distracting you from your game or movie (ghosting, lagging, screen tearing). For being a budget monitor, this monitor comes with a few pre-configured modes to pick from. You don’t have to use them, but maybe consider trying them out and tweaking them to your individual tastes. If you like editing pictures in your spare time, then you’ll enjoy the picture in picture and picture by picture modes. And the HDMI output slots enable you to share your screen with two other screens. Starting at a screen for long periods of time can leave you feeling tired. Luckily, the screen comes with a flicker free and blue light filter to help you stay comfortable, even when playing for long periods of time. Appearance wise, the LG keeps things clean with no flash whatsoever. This might be bland for some, but we suppose there’s some sacrifice when you’re limited by your budget. But what it lacks in appearances, it makes up for in its performance. The only thing we noticed is that the glossy black finish tends to be a dust and fingerprint magnet, so make sure you clean it regularly with a soft microfiber cloth dampened with an all-purpose cleaner. The stand is basic and doesn’t really offer anything extra other than tilting. If you don’t want to use the stand, there are mounting holes so that you can mount it to the wall, but you’ll need to purchase the adapters and hardware separately. 2 HDMI 1.4 slots, which will allow you to connect this monitor to your computer tower and gaming system. An audio jack, which you’ll probably want to use with your headphones or with a proper sound system since this monitor doesn’t have built-in speakers. Can even do some light photo editing without any troubles. Behind this Acer monitor’s display is a beast that boasts a 2560 x 1440 resolution. The colors are vibrant and easy on the eyes, and at 165hz, you can’t go wrong with this Acer. At 144hz, this little display makes the perfect gaming monitor without breaking a sweat. But if that’s still not enough, you can easily overclock this monitor to 165hz with incredibly great graphics that are stunning and life like, and with an impressive response rate. If you don’t intend to use it for gaming or fast action movies, then you might consider using it for graphic design, but only if you’re a hobbyist. The 16.7 million sRGB gamuts will suit the hobbyist well, but for professionals, you can still do better. Screen tearing is eliminated thanks to the NVIDIA G-Sync that comes preinstalled. Not surprisingly, this means these images will be crisp, while any movements on the monitor will be smooth without any lag or blurring; a common problem that seems to affect most IPS monitors. Another neat feature about this particular monitor is a specific mode that protects the eyes from straining during long periods of use. It works by maintaining the blue light emissions at a low level and eliminating the flicker from the display. While we’re on the subject of the colors and flicker, now would be a good time to mention the pixel density. Next, let’s discuss the GameView suite. Using the hotkeys on the monitor, you can setup and use crosshairs with ease and even manage or set profiles using those same hotkeys. Looking at this display, it has an aggressive appearance that is reminiscent of spacecraft technology. All kidding aside, this sleek display definitely commands attention wherever you place it. You’re not limited to just one screen orientation either. You can rotate it up to 60 degrees or for a complete portrait setup if that’s something you like, or you can title the screen forwards or backward up to 35 degrees. Hidden behind the case is a pair of stereo quality speakers that are decent sounding, but you would probably be best looking at a separate sound system if audio is important to you. There’s a small collection of buttons at the bottom right of the monitor that allows you to control the basic things, but there’s also a hotkey that you can use to adjust the presets or overclock the monitor with ease. A rather useful feature of this display is the extra gap at the bottom of the stand. You can use this gap to help organize your cables, so they’re not spread out all over in a mess behind your desk. The fact this monitor is 27” is perfect for both gaming and media enthusiasts, or even for creative who like to play with Photoshop. Beautiful design that stands out in the home office or gaming room. Stands at a 144hz refresh rate but is capable of being overclocked at 165hz. Pretty flexible monitor adjustment options compared to most monitors. NVIDIA G-Sync module ready to go. We get that there can’t be a one trick pony for gaming monitors, but we think for the price, it should be able to handle more demanding photo/movie editing software with more accuracy and better ease. That’s currently our only complaint. The LG 34UC79G-B should be a consideration for the most gamer or media enthusiasts. The resolution isn’t the greatest, but don’t let that put you off of this monitor entirely. LG found a work around by stuffing as many pixels as they could into this sleek panel and incorporating adaptive sync. Combined with a higher frame rate and a lot of preconfigured options to select from, this makes for crisp images and buttery smooth action from either your movies or video games. This particular monitor has a 34 inch IPS panel that has a very slight curve to it. The resolution is 2560 x 1080p, which puts it in the middle of the road compared to some other options out there. There are better options out there, but it’s still a decent choice if you just need something to hold you through till you can save up for an even better monitor, especially since the response time is 5ms. LG has your back covered though because despite these seemingly subpar stats, the frame speed more than overcompensates with 144hz refresh rate. This means your graphics and any fast-paced movements on the screen will be crisp and smooth without any lagging, tearing or blurring. Now despite being great with displaying images and playing video games, we wouldn’t recommend this particular monitor for anyone that needs to do any graphic design work. That’s because this IPS panel has a lower brightness level and it tends to produce colors that are on the lower end of the sRGB gamut. One other thing we noticed is that this LG panel is practically flickering free with a WLED backlight. You’ll also appreciate the customizable presets that come preloaded on this monitor. One of the best modes that we think most gamers will appreciate is the motion blur reduction mode. This forces the monitor to run at 1ms which helps reduce the blurring that can occur when you’re playing really fast paced games, like COD. LG didn’t stop there though. They threw in some extra features like Dynamic Action Sync and a crosshair stabilizer. This monitor can handle almost anything you throw at it so long as you don’t intend to go crazy with Photoshop or video editing. One of the first things you’ll notice about this monitor is the ever so slight curve this monitor has. It’s not too much, and it’s not too little. Aside from that, based on appearances alone, this display would look at home in most gaming rooms or offices. The black and red theme isn’t too aggressive where it would look awkward in a home office, but instead accents this monitor’s clean lines and build. Setting up is a breeze with the One Click-Stand Setup feature, and it comes included with two legs, but they can be detached if you want to mount it to a wall. The panel material is matte which is supposed to help reduce glare in bright rooms. The panel can tilt and the height is adjustable, but it can’t pivot or swivel. All of the connectivity ports are lined up on the right side of this monitor, so they’re out of the way but organized. Three USB 3.0 ports with one of those being capable of charging Quick Charge compatible devices rapidly- even while gaming. The Dell S2419H uses a glossy low haze IPS panel to deliver incredible graphics that appear to have a wet-look. Despite the graphics quality, we would probably peg this monitor more for workaholics who need their computer for more mundane productivity tasks. That’s not to say that this budget monitor can’t handle gaming, it can- just don’t expect the best performance with more demanding games. But if a little blur doesn’t bother you, then this could be the perfect monitor to meet your budget needs. It does have a bit of the typical IPS glow which is a haze that tends to bloom out of dark shades on the screen. It’s most noticeable in the bottom corners of the screen. The glossy screen surface does help improve the quality of the graphics, any ambient lighting hitting the screen will give the screen that wet magazine look. The graphics are smooth looking there is no grainy appearance either. The brighter elements in the graphics have a nice natural glow- not to be confused with IPS glow. They just pop out of the screen at you. The darker elements are decent looking, but make sure you keep in mind the IPS glow mentioned earlier. Some shades may appear darker on this monitor, but it’s not too obvious unless you’re sensitive to this issue. The color consistency is good, so the colors look good throughout the screen and there’s no saturation loss like you would see in some other monitors. The vibrancy is a little over the sRGB but not too much- so you get a rich look to it. This monitor does have a little bit of a blur and some trailing. For average users, this probably won’t be a problem though. This 23.8” screen features a 1920×1080 resolution which gives you plenty of desktop space, but isn’t really all that eye-catching for gaming. The pixel density is reasonable though. It’s not amazing but it’s not terrible, so it would work well for those who intend to use it for general use or everyday productive tasks. Is a fairly low priced monitor, so this makes sense. The Dell S2419H averages around a 5ms response time and a 60Hz refresh rate. So right away, it’s apparent this monitor isn’t designed for gamers. Although, tweaking with some of the settings, you can overclock this monitor to about 70Hz. This particular monitor does come with a flicker free and blue light filter which is important, especially if you’re going to be looking at the screen for long periods of time. Most monitors come with some sort of Menu that can be accessed through the settings and it’s here you can play with the pre-configured options and also adjust the usual brightness/hue, volume, and input source settings. While this monitor probably isn’t the best for gamers, we think the ComfortView is perfect for anyone who intends to be looking at their screen for long periods of time or who likes to use their monitor for some heavy duty reading. The screen does have a glossy screen surface, but there’s also a mild anti-glare filter. Despite this, this monitor can be sensitive to certain lighting conditions, so be mindful of that. The bezels are thin and surround the screen on all four sides. They’re nicely designed and not too distracting. The silver matte stand is pretty standard for most budget monitors. It’s not flashy or eye catching so it will look good in most home offices. At the upper base of the stand, you do get a cable tidy loop to help keep your wires from taking over your desk which is always a plus. It is a tilt only stand which is great for ergonomics, but you can only tilt it back and forwards a bit, other than that- there is no other way to adjust the height or angle of the screen. On the bottom of the panel, there are some speaker grills which houses the built in stereo speakers. The sound is decent but what you would expect from a budget monitor of this type. So if you enjoy listening to music while you play around in excel sheets, then you may want to purchase a separate sound system which you can connect via the headphone jack. However, if sound isn’t that important to you, then this sound system will be fine to use occasionally. The back of the monitor is a glossy black with the silver Dell logo in the center. One thing about glossy surfaces is that they tend to attract smudges and dust really easy, but since this may be facing towards a wall, it may not be a big issue to you. There is a cable lock feature in the back, but most users probably won’t need it if you’ll be using this monitor in your home, but if you share a dorm room with some college mates, then maybe it’s not such a bad idea. The ASUS ROG Swift PG279QZ offers a 27-inch screen with a 1920×1080 resolution, 144-hertz refresh rate, and a three millisecond response time. All at budget pricing too. And yet looking at it, you would never know the difference between it and its premium competitors. One of the biggest things you’ll notice about this, ASUS monitor is that it has a lower pixel density. This isn’t necessarily a bad thing, but it will cause images to have softer edges. This may bothersome and others, not so much. The monitor has a great color quality and accuracy at 99% of the sRGB gamut. So it’s perfect for gaming and some multimedia editing tasks that require the greatest of accuracy. One thing that can be bothersome is that the gamma can make the blacks take on a grey-ish tone, and other colors end up looking a little washed out. This isn’t too noticeable except for in extreme circumstances, or you’re sensitive to the issue. The backlight does tend to bleed along the edges of the screen, but it’s not noticeable until the screen is pitch black. The graphics of this ASUS monitor are incredible, to say the least. There’s no blurring, no lagging or screen tearing that can otherwise ruin the gaming experience. In fact, it handles just about everything you can throw at it with hardly needing to calibrate or adjust things. But if things aren’t to your liking, it’s possible to further tweak things with the overdrive features. FreeSync is included with the ability to go from 40 hertz to 144 hertz easily. Gamers who prefer G-Sync will be pleased since the monitor is compatible here too. The exterior has a matte black finish that won’t attract dust or fingerprints, and the stand is sturdy, keeping this monitor stable. The stand allows the monitor to tilt, swivel and pivot with ease. Adjusting the height is easy and can be done in just a few seconds. The ASUS ROG Swift PG279QZ monitor has a little toggle on the bottom of the monitor that may easily be overlooked. But using the toggle switch and the hotkeys it makes it easier to switch between the pre-configured settings. There is no USB port so keep that in mind if you have extra accessories that you would like to plug into your monitor. This is one of the few monitors that has built-in speakers, and while they may be alright for normal productivity tasks, the quality will probably make you consider grabbing a better sound system. Beautiful budget monitor on a stable and durable stand. Great pic and graphics quality with no blurring, screen sharing or lag. No USB ports and toggle can be hard to miss since the red ring around the toggle doesn’t light up like you think it would. The Acer Predator X27 would probably be the best model to pick if you can afford to splurge but know that getting this monitor to go full tilt could take a little bit of tweaking. Most don’t know this and try running the monitor at default settings, which will suit you fine probably. But if you really want to release the beast, it’s going to take some playing around with. As mentioned before, pushing this ACER to its full capacity can take some adjusting. If you try to play on it without some calibrating, the HDR and 144hz refresh rates need to manually be enabled. You can do this by opening up the control panel via the red toggle stick and the four buttons on the back of the monitor. Once you’ve opened up the control panel, select 144 Hz. Once finished, the new refresh rate will appear on the NVIDIA where you can select it. That’s not the only thing you can do with the toggle and the hot buttons though, but they certainly make it easier to adjust everything you need without over complicating the process. When it comes to gaming, The ACER delivers. The graphics are crisp and smooth, which enhances the gameplay because of how realistic everything looks. The 4k and the GSYNC is just an added bonus. The 4k does come at a price. To achieve this, you need to have the latest graphics card, which doesn’t come cheap. But that’s not all because you need a gaming tower to support all that power and not just any ordinary gaming tower. Appearance wise, we would consider it neither too flashy nor boring. The stand allows you to adjust the height and feels pretty stable. The ASUS Predator X27 monitor does come with an optional hood which seems to submerge you further into the gaming experience, but aesthetically speaking it looks a little odd. IPS vs TN Gaming Monitors – What’s the Difference? If you read the above reviews and you’re new to picking out a new monitor, you’re probably wondering what the heck refresh rate or response time means, and why it’s important. With all kinds of monitors available to the market, it can be challenging to pick a monitor that may meet your needs. Will you be using it for gaming, design work, or just everyday use? Depending on the use, the refresh and response times will be one of the most important things you’ll need to prioritize if you game since it can impact your game experience. Creative professionals who do a lot of design work will want to keep their eye out for a monitor that has vivid but accurate colors. In general, the higher the resolution, the better you can expect the pictures and details to be since the resolution is just telling you how many pixels are crammed into your display. While shopping, you’ll see things like 1080p or 2k and 4k displays, and that just means that there are more pixels so the images will be more detailed and realistic. Next, you’ll want to look at response times, but don’t worry too much about these unless you intend to be doing some intense gaming. For the fast-paced games or movies, you’ll want shorter response times since this means the pixels can keep up with the fast changing colors and hues. Longer response times could cause a blurring effect which can be tolerable for some but extremely noticeable and annoying for others. In general 5ms and 1ms are decent response times, but it will come with a price. This corresponds to how quickly your monitor will respond to new changes on display. Typically, these numbers are displayed as numbers, or more specifically, hertz. The bigger the numbers, the more smooth your images and graphics will appear. For gamers, they’ll want the smooth buttery movements, so they’ll want to look at a minimum of 75hz. If you intend to use your monitor for general use or to play around in Adobe Photoshop, then you can sacrifice lower refresh rates. Less importantly is what type of display you want. Some people believe that the curved display improves the gaming experience, but others disagree and say they’re more prone to a glare from light sources like a nearby window. A curved display is an aesthetic detail and isn’t important to the performance of your monitor, so this is a matter of personal choice. If you’ve ever played a game or movie and it briefly looked like a collage of three pieces of the same image incorrectly lined up, then you’ve experienced screen tearing. This happens when the graphics card and the monitor fall out of sync with each other. The first two options will prevent screen tearing while you’re playing your games or watching those fast action movies. But if you pick any of the other two, then you’ll want to keep in mind that those may limit things since the AMD FreeSync is only compatible with AMD graphics cards and the same goes for NVIDIA. Prices will vary depending on which option you pick, so keep that and any upgrades you have in mind as you choose. Screen size is a matter of personal preference and will depend on how you intend to view your screen. If you’ll be sitting directly in front of the monitor, then you can opt for anywhere from 21 to 27 inches. Bigger screens are more comfortable when viewed from afar to prevent eye strain, so keep that in mind too. 5mm Audio Out- Used to connect your headphones or gaming headset too. HDMI 1.4/2.0 – also for audio and video transfers but generally not for higher refresh rates with higher resolutions. If we had to pick one of the monitors from this list, it would probably be the Acer Predator X27. It’s easy to hit the ground running with this monitor since it’s easy to calibrate. Upgrades can be a pain with most other monitors, but with the Predator, you’ll always be ready for the latest and newest technology.